Motherwell have signed goalkeeper George Long, midfielder Conor Grant, winger Marvin Johnson and forward Nathan Thomas on transfer deadline day. Long, 21, and Grant, 19, join on loan for the rest of the season from Sheffield United and Everton, respectively. Johnson, 24, moves from Kidderminster Harriers for an undisclosed fee. Thomas moves north from Plymouth Argyle on a deal until the end of the season with the option of a further year. Well manager Ian Baraclough said: "George will increase the competition in a crucial position for us." Baraclough was also enthusiastic about the other arrivals. "Conor is an exciting young talent who I've seen and watched on several occasions with the Everton development side," said the Well boss. "He can play in a number of midfield positions and has great energy, exactly what we require for the last few months of the campaign. "Nathan is a player I have being keeping tabs on for some time. "Like Marvin, he's very quick and can be a match winner. We now have different options and different ways to play. "He can be effective on both flanks or even through the middle, so the versatility will be a real bonus for us. "Like the others we've signed, he has a point to prove and we hope to take advantage of someone with fire in his belly. Midfielder Grant added on the Motherwell website: "I want to bring some creativity to the side and will give 100% to hopefully help them climb the table." Motherwell have slipped to second bottom of the Scottish Premiership table after failing to win in their last six outings. 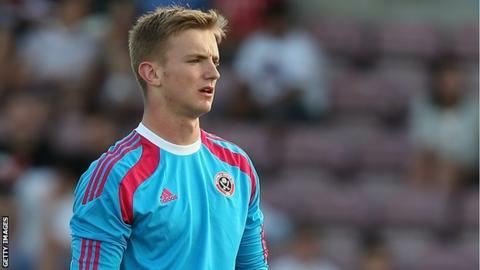 Goalkeeper Long, who made his Blades debut aged 17, is looking forward to the next stage of his career. "It's a new challenge for me to play in Scotland," he said. "It will be great to get back playing and hopefully help push the team up the table." United manager Nigel Clough told his club website: "We've consistently said that he would benefit from playing on a regular basis and we hope this will be the case at Motherwell."